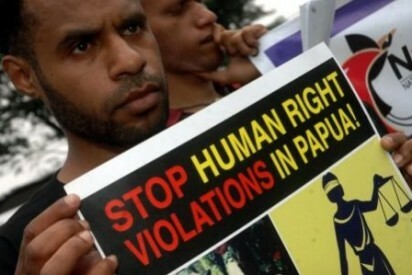 On Monday 25th August, the Free West Papua Campaign organised demonstrations in 5 different countries all over the world in support of the release of the two French journalists, Thomas Dandois and Valentine Bourrat, who were arrested and jailed by the Indonesian police 3 weeks ago just for reporting in West Papua. It is a clear example of how the Indonesian government is trying to hide the atrocities in West Papua, by banning and arresting foreign journalists, even though last year the Indonesian foreign minister and the local Governor said that they welcomed journalists into West Papua. Thomas Dandois and Valentine Bourrat had been in West Papua making a documentary about the situation for French/German TV Network, Arte. The Indonesian government still bans all foreign journalists from entering West Papua and so when the police found Thomas and Valentine on 6th August, they promptly arrested and jailed them. Thomas and Valentine are now being threatened with a 5 year jail sentence and $40,000 US dollar fine for simply being journalists in West Papua. On 21st August, Nobel Peace Prize Nominee and Free West Papua Campaign founder, Benny Wenda issued a press release, in which he called for worldwide protests for the freeing of Thomas and Valentine. Benny’s statement was widely distributed and in answer to the call, protests were held around the world in support of the journalists’s release. 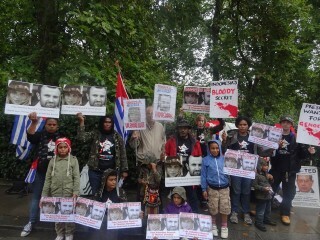 In London, United Kingdom, the Free West Papua Campaign held a protest outside the Indonesian Embassy and demanded the release of Thomas and Valentine. Free West Papua Campaign Netherlands also protested on Monday in the Hague, first outside the International Court/Peace Palace and later outside the Indonesian Embassy. Afterwards, a petition was handed to the French Embassy calling for their support in helping to pressure the Indonesian government to free the pair. The Free West Papua Campaign in Papua New Guinea also held a demonstration in the capital city of Port Moresby. 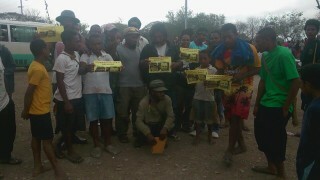 The next day, the Campaign in PNG also appeared on the National Tok Bek Radio show, raising more awareness and backing for the release of the journalists. 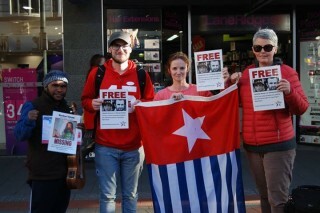 Another demonstration was also held in the Australian island of Tasmania and in Yogyakarta, Indonesia, members of the West Papuan Students Alliance (AMP) also held a gathering to show support for Thomas and Valentine. The students called for their freedom and held a slideshow presentation about the journalists. Despite being a peaceful gathering, it was surrounded by dozens of armed Indonesian riot police who intimidated the students and dispersed the demonstration. On behalf of all the branches of the Free West Papua Campaign around the world, we give our full and sincerest thanks to all those who came out to demonstrate and show their support for the release of Thomas Dandois and Valentine Bourrat. This campaign has grown from a small group in the United Kingdom to a wide international network with several permanent offices and we are very encouraged to see that increasingly there are more and more people around the world attending such joint international days of action for freedom and justice in West Papua. We send our deepest sympathy and thoughts with the families of Thomas and Valentine at this time of great concern and we would like to assure them that we will never stop struggling for the release of their loved ones until they are finally free. 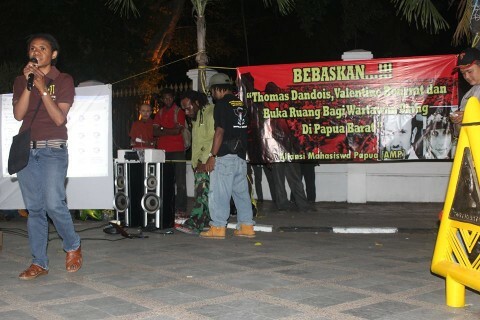 Finally we would like to thank Thomas and Valentine themselves for the incredible courage, strength and righteousness that they have shown, not only for reporting on the situation in West Papua but also for sacrificing even their very own freedom by telling the story of the West Papuan people. Keep up your spirits, Thomas and Valentine. We firmly believe that you will soon be free and that one day we will meet you both in a Free West Papua. We will continue this campaign for your freedom and the freedom of everyone in West Papua until this vision finally comes true.